PNNL's Report, The Smart Grid: An Estimation of the Energy and CO2 Benefits suggests a smart grid could reduce carbon emissions 12 percent by 2030. 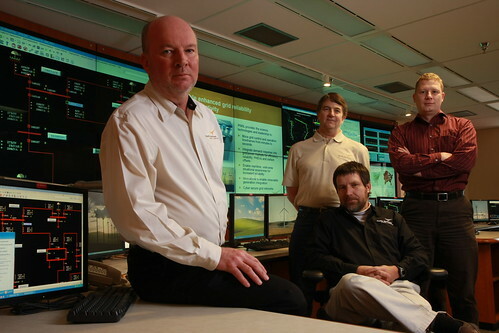 Pictured at PNNL's Electricity Infrastructure Operations Center are four of the report's authors (from left to right): PNNL Scientists Rob Pratt and Tom Secrest; and PNNL Engineers Michael Kintner-Meyer (seated) and Kevin Schneider. RICHLAND, Wash. — A smart electrical power grid could decrease annual electric energy use and utility sector carbon emissions at least 12 percent by 2030, according to a new report from the Department of Energy's Pacific Northwest National Laboratory. The report, The Smart Grid: An Estimation of the Energy and CO2 Benefits, shows a direct link between the smart grid and carbon emissions. It evaluates how different functions of the smart grid could provide substantial reduction in energy use and carbon emissions - both directly by using new technology and indirectly by making renewable energy and efficiency programs more affordable and potentially larger. That means by fully utilizing a smart grid, the nation could prevent the equivalent of 442 million metric tons, or 66 typical coal power plants' worth, of carbon emissions from entering the atmosphere each year. Those 66 power plants produce the equivalent amount of electricity needed to power 70 million of today's homes. "By making the grid smart, we make it more efficient and more accommodating of renewables, and we're able to cut down on the amount of carbon we emit to generate the electricity we need," said Rob Pratt, PNNL research scientist. "This report suggests that we could substantially reduce emissions by deploying a smart grid." "We wanted to show the additional benefits inherent in the smart grid's potential contribution to the nation's goal of mitigating climate change by reducing the carbon footprint of the electric power system," he said. Until recently, the fields of emissions research and smart grid research have been largely separate, even while both strive to secure the nation's energy future. The report joins a growing body of literature that allows researchers, analysts, investors and policymakers to make a definitive link between the two areas of study — and defines the linkage as a legitimate area for further research and technology development by government. It also informs the business case for smart grid investments by utilities and others. "This report has significant implications for public and private sector interests engaging in future research, financial and policy decisions in this area," said Mike Davis, PNNL associate laboratory director for Energy and Environment. "Reducing our dependence on foreign oil and reducing our carbon footprint can go hand-in-hand and be profitable." Pratt led a team of eight authors on the report. They analyzed nine different ways, or mechanisms, by which the smart grid could reduce carbon emissions. They also outlined recommendations for future and additional research in each of these areas to fulfill the Administration's goal of substantial reductions by the year 2030. The DOE Office of Electricity Delivery and Energy Reliability's Smart Grid R&D Program funded the study. Learn about the direct and indirect impacts of a smart grid. Direct mechanisms reduce electricity and CO2 emissions when smart grid functions are implemented. Direct mechanisms include incorporating smart grid-enabled diagnostics in residential and commercial buildings; adding more plug-in hybrid electric vehicles to the market; and benefiting from the conservation effect of consumers being more aware about their own energy use - a mechanism that is made possible by a smarter grid. Indirect mechanisms are realized when smart grid capabilities are used to reduce the costs of deploying and operating efficiency and renewables. These cost savings can be turned into carbon savings by reinvesting in carbon reductions down the road. Using demand response and energy storage devices to bring renewable energy on the grid is one indirect mechanism that can reduce the need to build additional power plants to handle the increased reserve power renewables require. "The importance of the direct and indirect reduction mechanisms is in their combined effect on reducing carbon emissions," said Pratt. "Some mechanisms proved insignificant, and the larger ones each appear capable of providing about a 3 percent reduction. In combination, they could reduce the electric grid's carbon footprint by a very substantial 12 percent or more." "This is very significant in light of future renewable portfolio goals of 20 to 30 percent set for the electricity sector in many states for the 2030 time frame, with even higher subsequent goals being contemplated as part of a national carbon policy," he said. The estimates assume full deployment of a smart grid or virtually 100 percent penetration of smart grid technologies. They can be scaled down in proportion to actual smart grid penetrations to estimate the potential reductions at any given level of deployment over time. A smart grid incorporates multiple technologies into the existing electricity delivery system and enables more visibility and control of both the existing electricity infrastructure and new "smart" components, such as smart meters, automated demand response, plug-in electric vehicles and electricity storage devices. The smart grid's much broader cost and operational benefits are provided through high-speed, two-way communication, sensing and real-time coordination of assets all the way down to the customer meter and other end use devices, such as smart appliances and thermostats. A basic perspective of PNNL's analysis is that, during the next 20 years, smart grid technology will become pervasive in the U.S. because of the cost efficiencies and reliability improvements it provides for the electric power system. Clearly, once purchased, this same infrastructure can be leveraged to provide the additional benefits identified in this report with little, if any, marginal cost. PNNL's recommendations include further analysis of some technical aspects of the mechanisms, further study of behavior-related mechanisms such as the impact of consumer information, and better accounting for the range of uncertainty for the reductions estimates, as more definitive analyses are conducted and better methods are tailored to estimate each mechanism's potential. PNNL's report also analyzes a variety of existing research including related assessments by the Electric Power Research Institute (EPRI) and The Climate Group.